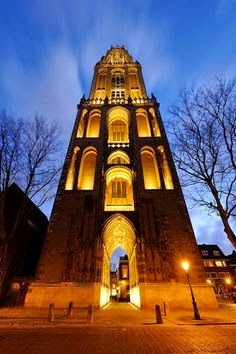 Dear readers, with this beautiful photo of the Utrecht Dom Tower on a cold winter night, this blog is taking its Christmas break. I would like to thank all of you for all your contributions and information, especially those of the guest bloggers and commentators which feed into this blog. Across the world, 2014 was a horrendous year from a human rights perspective, with all the ongoing armed conflicts affecting large numbers of people, especially children. In the face of this, every contribution large and small to defend and uphold human rights, from the lowest court to the European Court in Strasbourg and by all of us, is all the more necessary. The coming year in that sense presents us with as many challenges on this front as ever. All my best wishes to you for the holiday season and for a good 2015! In what can be characterized as a legal bombshell just before Christmas, the Court of Justice of the European Union (CJEU) this week issued its long-awaited Opinion in which it held that the Draft Agreement on the Accession of the European Union to the ECHR is incompatible with EU law. This means that accession under the current draft agreement has become impossible. The very long and winding road, by now a saga whose start can be traced decades back, of the Union's accession to Europe's foremost human rights treaty seems to have become even longer. And the end is not in sight at all yet. Eighteen years ago, in 1996, a first attempt at rapprochement between the two European legal systems had also been halted by the (then) European Court of Justice. In its Opinion 2/94 it held that the European Community, as it was called at the time, did not have the legal competence to accede to the European Convention on Human Rights. That first setback led to years of negotiations culminating, through the Treaty of Lisbon of 2009, in a change of Article 6 of the EU Treaty. The current provision includes a paragraph stating that the European Union shall accede to the ECHR. Importantly, it also states that accession shall not affect the Union's competences. In a mirroring exercise, on the Council of Europe's side, Protocol 14 to the ECHR - which entered into force in 2010 - enables accession of the EU to the European Convention. Until then, only states could accede. Once these two fundamental building blocks were put in place an arduous negotiation process could start culminating in a complex Draft (revised) Agreement on EU accession to the ECHR in 2013. Since this was a proposed international agreement between the European Union and other parties, EU law (Article 218 TFEU) required that the Court of Justice of the European Union had to give its opinion on the compatibility of the draft with European Union law (see for other subsequent steps to take, my earlier report here). The European Commission, which had been the main negotiator on the EU's side in the process leading to the draft agreement, asked the Court for its opinion in July 2013. No less than 24 (of the 28) EU member states intervened in the procedure, showing the high legal and political interest which the procedure raised. This week, this Opinion was issued, with a result that for the time being puts a halt to any progress on this front. For the negotiators it is back to the drawing table, but coming to a new, acceptable result will be rather difficult considering the fundamental points in the CJEU's Opinion. The Court's substantive views can be found from paragraph 144 onward (part VIII ff.). The Court notes the progress since its Opinion of 1996 in that there is now, through the Lisbon Treaty, a legal basis for EU accession to the ECHR (para. 153). Emphasizing that the European Union has a specific nature which distinguishes it from states, the Court notes that the draft Agreement rather seems to treat the EU as much as possible as a state. By contrast, the Court notes that the EU is by its very nature not a state (para. 156). The Court notes a number of issues which are fundamental but not addressed explicitly or solved to a sufficient extent in the draft Agreement. First, the draft Agreement risks negatively affecting the special features and autonomy of EU law in a number of ways. Coordination between Article 53 of the ECHR (safeguards for existing human rights) and Article 53 of the EU´s own Charter of Fundamental Rights (level of protection of rights). In addition, the principle of mutual trust under EU could be undermined - which is especially relevant in justice affairs (the EU´s area of Freedom, Security, and Justice). And no provisions are included on the linkages between the EU´s preliminary ruling procedure and the advisory procedure under Protocol 16, in both of which national judges can turn to European Courts. Second, the Court notes that a key element in the draft Agreement is contrary to EU law. Article 344 TFEU binds Member States not to put disputes concerning application or interpretation of EU Treaties to any other means of settlement than provided for in those Treaties. Since the draft Agreement does not preclude disputes on human rights application to be to review by Strasbourg (article 6 of the Draft Agreement replaces the inter-state mechanism by an inter-part mechanism), this could affect Article 344 TFEU. Third, the Draft Agreement´s part on the co-respondent mechanism and on the procedure for prior involvement of the court of Justice do include safeguards to preserve the special characteristics of the EU and European Union law to be preserved. Fourthly, in the Court's view the draft Agreement is problematic on the point of the Union's Common Foreign and Security Policy (CFSP). Under EU law, the Court has almost no jurisdiction over these issues. The Agreement, by contrast, does not rule out that the European Court of Human Rights would be able to rule on issues of CFSP). Strasbourg thus would be allowed to rule on issues on which Luxembourg (within the EU legal system) is not allowed to rule. This would entail giving exclusive judicial review to a non-EU body on matters of CFSP, in sofar as they relate to compliance with ECHR rights. In line with its own earlier case-law excluding external, non-EU review of EU acts or omissions, the Court refuses to make an exception for an external system that is geared towards the protection of fundamental rights. As Steve Peers has rightly noted (see link to his comments below) this amounts to politics of the playground. What Luxembourg cannot have, Strasbourg will not have apparently. As a result of these aforementioned shortcomings, the draft Agreement is, in the Court's view, incompatible with EU law. This is a rather different conclusion than the one reached in June 2014 by the Court´s own Advocate General Kokott in her views on the issue. She formulated a smaller, less far reaching lists of safeguards which would have to part of the deal. Her conclusion was more of the nature of a “yes, if” rather than a “no, unless” (as the Court now has done). The EU as a whole now faces a very difficult challenge. On the one hand, it shall accede to the ECHR as its own key Treaty requires it to and it thus has to carry on with its efforts in reaching that goal. On the other hand this is now impossible, unless a large list of key changes are made to the draft Agreement. Changes which would have to be agreed upon not just by the EU and its member states but by all State Parties to the ECHR. Non-EU countries may very well lose their patience with the EU and not cooperate, as the previous outcome was already reached after arduous negotiations, for the most part difficult because of internal EU difficulties. There may be another reason than loss of patience which may undermine the willingness of these other states to agree with such changes. By explicitly holding on to the different nature of the EU and in fact to its own apex position, the CJEU makes it almost impossible to close the human rights gap identified by so many year (especially in the area of CFSP). An amended draft Agreement may cast into stone the current factual shortcomings in human rights protection by not giving the European Court of Human Rights its full role as the highest human rights court in Europe. But this is not just a struggle between the EU and non-EU states, it is also very much one between the Member States and the Luxembourg Court. Even if all EU Member States want to submit the EU´s actions to an external human rights adjudicator, the CJEU has effectively blocked it basing itself on the nature of EU law. The only way to change that would be to change the EU Treaties themselves. The choice thus seems to be one between two very difficult roads, both of which would take years to travel even in the most optimistic assessment. The CJEU's press release on its Opinion (2/13) is available here. 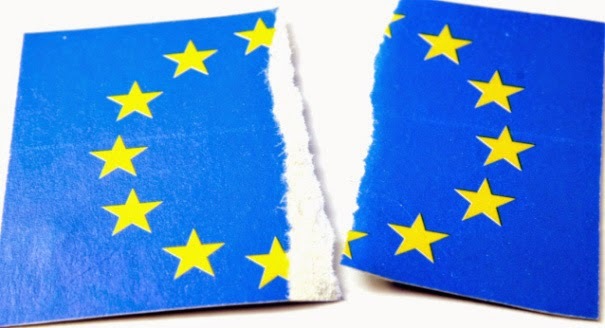 Other recent comments on the Opinion have been made on the EU Law Analysis Blog by Steve Peers - extensive, well-informed and critical - and over at EUTopialaw by Aidan O'Neill. More are sure to follow. For the time being, the Opinion will lay as a not so welcome Christmas gift under the tree from Luxembourg or as a legal turkey that is stuffed with content which is difficult to swallow for all the negotiators involved in the previous steps. For now, it seems that the Opinion is more about safeguarding the CJEU's position at the apex of the EU's legal order rather than at closing a long-standing gap in European human rights protection. To be continued in 2015! As of 1 November 2014, about 78,000 applications were pending before a judicial formation of the Court. Although the Court’s docket has been reduced by nearly 50% over the last three years, this still represents a very significant number of cases to be brought before an international tribunal and continues to threaten the effectiveness of the right of petition enshrined in the Convention. The vast majority of cases (92% in 2013) will be rejected by the Court on one of the grounds of inadmissibility. Such cases clog up the Court’s docket and obstruct the examination of more deserving cases where the admissibility requirements have been satisfied and which may concern serious allegations of human-rights violations.The 2010 Interlaken Conference on the reform of the Court called upon the “States Parties and the Court to ensure that comprehensive and objective information is provided to potential applicants on the Convention and the Court’s case-law, in particular on the application procedures and admissibility criteria”. The Court’s first response to the call was to prepare a Practical Guide on Admissibility Criteria which clearly sets out the rules and case-law concerning admissibility. This third edition covers case-law up to 1 January 2014 and the stricter procedural conditions for applying to the Court which came into force on that date. Practitioners and prospective applicants should study this Practical Guide carefully before deciding to bring a case before the European Court of Human Rights. 2013 jährte sich das Inkrafttreten der Europäischen Menschenrechtskonvention zum 60. Mal. Seit ihrem Bestehen hat die Konvention insbesondere durch den auf ihrer Grundlage gegründeten Gerichtshof den Schutz der Menschenrechte in Europa wesentlich gestärkt. Mit ihren mittlerweile 47 Vertragsparteien ist sie zu einem gesamteuropäischen Grundrechtsschutzsystem geworden, dessen Akzeptanz sich nicht zuletzt an den in den vergangenen Jahren rasant gestiegenen Fallzahlen zeigt. Dennoch steht die EMRK auch in der Zukunft vor besonderen Herausforderungen. 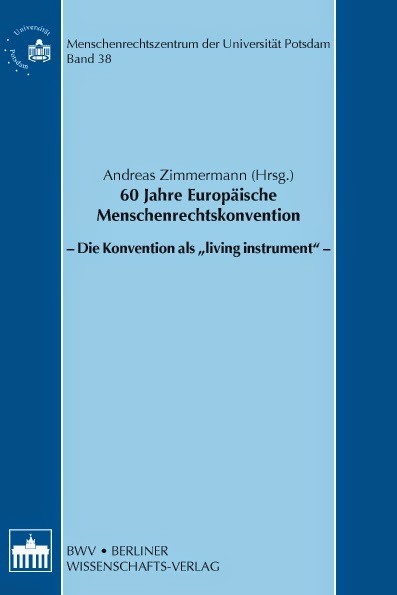 Dieser Band stellt den Versuch einer Bilanz der vergangenen 60 Jahre dar und enthält die Beiträge der Vortragenden des Workshops „60 Jahre Europäische Menschenrechtskonvention – die Konvention als ‚living instrument‘“, der anlässlich des Jubiläums durch das MenschenRechtsZentrum der Universität Potsdam veranstaltet wurde. Schwerpunktmäßig beschäftigen sich die Beiträge mit der Rechtsfortbildung durch den EGMR, insbesondere mittels einer dynamischen Auslegung der Konvention, der konstitutionellen Dimension der EMRK, der Durchsetzung seiner Urteile sowie dem Reformbedarf aufgrund gestiegener Arbeitsbelastung.